Malang natural charm is never exhausted to explore, Ngalamers. 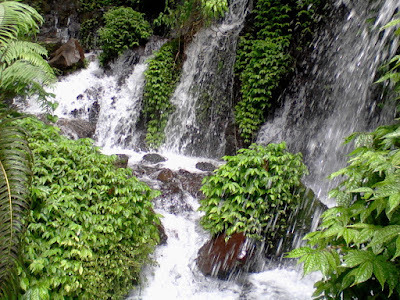 Now halotrip opportunity to visit natural attractions, waterfalls (Coban) in the eastern city of Malang. Niagara source or Umbulan Pitu Pitu, so the local people call it.Sumber Pitu Waterfall is in the mountainous western region Bromo, precisely located in the village of Duwet Krajan, District Tumpang, Malang. Because of its location away from public transport, Ngalamers advised to use private vehicles, both motorcycles and four-wheel. Being one lane in the direction of Mount Bromo and Niagara (Coban) Pelangi. To go Duwet Krajan, market Tumpang, the visitors must travel to the Village Hall Wringinanom, directions Gubuk Klakah. Furthermore, in right in front of the village hall, left there is the main road towards Duwet Krajan. Until the parking location is within about 3-4 Km, passing the apple plantations and vegetable greener. Visitors can park around the Village Hall Duwet Krajan and slightly in front of the garden Clove, locals will be happy to keep the vehicle Ngalamers with seikhlasnya rates. There is no entry fee to get to this area, but do not be surprised if the locals will be asked for voluntary donations to repair the access road to the location. Cloves from the garden, tourists will be welcomed concrete road through the forest of bamboo are very beautiful, the gateway to the area of rice fields and giant cliffs around the waterfall. From here the journey is about 2 kilometers. Walking about 15 minutes, Ngalamers will meet a T-junction in the middle of rice fields (when halomalang been there is a pile of pipe PDAM). Left past the hut Watu-ramps but far enough play. The right is a short street that will be just above Ringin Gantung waterfall must pass through the emergency staircase of bamboo down a cliff as high as approximately 40 meters. It takes guts, and fun - but not recommended if the condition drizzle and visitors fear of heights. This is an advantage if a visit to Sumber Pitu. Visitors can enjoy the beauty of the two waterfalls at a single location. Not far from Sumber Pitu, flowing Ringin Gantung waterfall from a height of about 40 meters. Known hanging ringin because there is a banyan tree attached to the west side of Niagara Falls.On the north side of the cliff is Ringin Gantung Umbulan Pitu emit clear water and heavy on the sidelines during the green plants that shut down the cliff wall. Not too high, but (was) quite exotic. Debit and color of the water that comes out of the seven (7) springs not affected weather conditions, wet and dry. Local residents believe that the Air Resources Pitu associated with the Mount Bromo. In fact, many people from outside the area which makes this location as a place of ritual, as well as consider the water coming out is holy water. If you've ever been to Sumber Pitu about 2-3 years ago, conditions are very different now drastically. Right in front of the waterfall being built giant pools of water for taps which has started the process of finishing. The location that was once very beautiful and isolated. In the vicinity of the waterfall is also used as landfill material projects. Later if completed, all the water that comes out of Sumber Pitu will be accommodated in the tank this. 0 Response to "Sumber Pitu Waterfall & Ringin Gantung Waterfall"